Joy and Jessica Stefani are unlike any teenage sisters their age: they were born with the ability to Hear others' Whispers, their secret desires. Jessica loathes this "curse", and is friendless and bitter as a result. Joy thinks of the ability as a gift, and is very close to her mother, from whom she inherited Hearing. As the years go by, Joy and Jessica grow further apart, and Joy gets more and more frustrated with her sister. But then one day, Jessica disappears, and Joy's powers begin to change. Then, she Hears a terrifying Whisper from Jessica, propelling her on a search for her sister with an unfamiliar boy, Jamie, with a strange ability of his own. 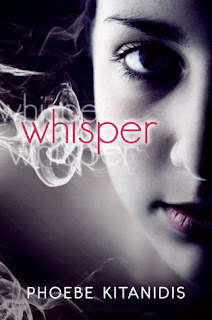 Interesting and intriguing, Whisper is a different take on paranormal fiction. There isn't an evil plot to overthrow or some enemy to beat, but rather Kitanidis's debut focuses on the complexity of Hearing desires, and its affect on the relationships that Joy and Jessica have and their emotions. Joy and her mother believe that Hearing can help them make the world a better place, but Jessica is more cynical, and their father cannot Hear at all, making for some very interesting family dynamics. But as Joy's ability changes, she also learns quite a bit about her parents; her mother isn't the perfect saint she thinks she is, and her father isn't distant on purpose. This knowledge forces Joy to stand on her own and make her own decisions, and readers will be happy to see that she rises to the occasion. It would have been nice to have some more details on how and why Joy's Hearing changed, and how Jessica tried to rid herself of hers, but the lack of that information doesn't really detract from the story. In fact, the mystery and suspense of it propel the plot along, and introduce Joy to Jamie. They are both bold and determined to find Jessica, though their actions do make them seem very mature and independent for their age. Nonetheless, their resourcefulness and perseverance lead them to the truth, with many heart-pounding moments along the way. Whisper wraps up nicely, without demanding a sequel, and with a lot of optimism for the future. This is an excellent coming-of-age novel about love and the complexity of relationships with a paranormal element that will hook teens from the beginning. Cover Comments: I like the dark colors in this cover, and how the wisps of smoke are used--it's a very neat effect. The pink in the title stands out really well!